A brand is a critical part of the business. It’s the voice that sparks a connection with another, the visual story we choose to share, and at the end of the day the message we want to convey. In conversing on the design and strategic process of building spaces for our clients, at the core we continue to ask ourselves, how can we create work environments that perhaps bring a smile and engage each individual that will come to call their new workspace home? How can we better build this sense of human to space connection through branding? 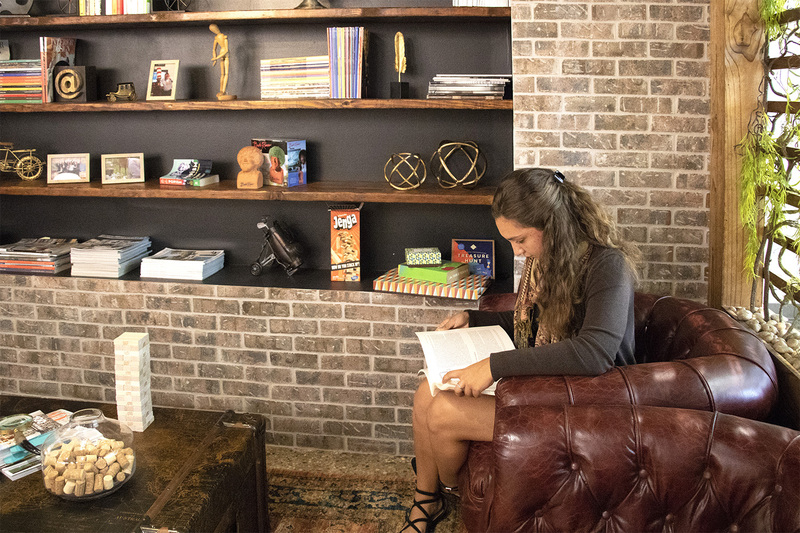 Some of the most inviting and memorable office spaces are the ones that I can connect with on a conceptual level – the ones that relate to me as a person. Whether it’s artificial or natural light, color palette, or how people are interacting within a space, always suggests to me a larger story – one that I can decide if I believe in and want to be a part of the narrative. Amanda Garbarino, Architectural Graphic Designer in Studio Eagle Living Room. Location: Springfield, NJ. At the core of branded spaces are a representation of visual identity, architectural opportunities for employees to build relationships, and a unified expression of company culture. 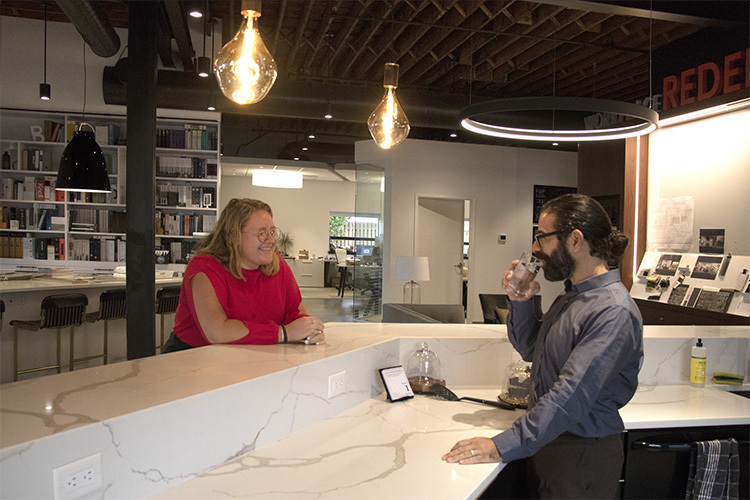 When we celebrate culture through workplace design, we are able to foster communities that can grow more meaningful relationships within their day to day environment. What we have found is that thoughtfully designed and branded workspaces ultimately become the homes for these relationships. We need to ask ourselves how does workplace design affect and impact employee experience at each touchpoint, and what message does that convey to their clients? What does that message look like and in turn what does that tell us? Time after time what I have found so very inspiring is how the smallest of conversation can bring forward the largest insight. Camryn Macdonald, Furniture Assistant, and Mark Lo Bue, Workplace Strategy Director in Studio Eagle Kitchen. Location: Springfield, NJ. For workplace design and delivery firms, we have an important role to play in helping tell our client’s stories – both the role of the individual team member and the company as a whole. This can be an inspiring problem or daunting challenge. Ultimately workplace designers and strategists need to position themselves as storytellers. And with this comes great responsibility – how best to speak a brand’s voice through a built space. When we delve deeper to truly understand the vision, culture, and values of our clients, as designers and inspired individuals, we can then place ourselves in their narrative to better build their brand story – literally.